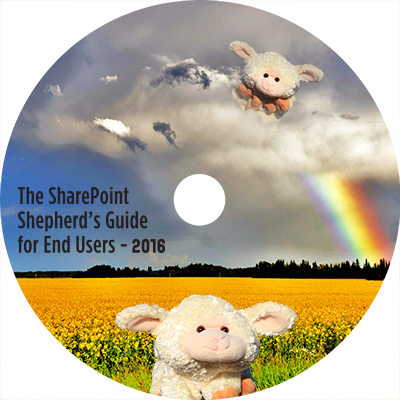 The SharePoint Shepherd’s Guide for End Users: 2016 Corporate Edition (Tutor) is the solution you need to help your users be effective, reduce your help desk calls, and improve adoption in SharePoint on premises, SharePoint Online, Office 365, or a private cloud. Many organizations are struggling with a way to help their users become effective with SharePoint. They may have spent a great deal of money implementing SharePoint and now are struggling with frustrated users and climbing support calls. The Shepherd’s Guide helps by leveraging research about how people learn and expertise in instructional design to provide the best materials to make the SharePoint experience better. In addition, there is guidance that helps users decide which site template to use, whether to use a folder or metadata, whether to use a list or a library app to store their content, and other content designed to help them make important design decisions. Aren’t you tired of your training budget getting cut and feeling like there’s no way to get the users the training that they need? Why don’t you turn the tables and cut your own training costs, but do it while maintaining – or improving – the training the end users receive? The Shepherd’s Guide costs less than instructor-led training and, based on the work of Malcom Knowles and his colleagues about how adults learn, it trains them better. Don’t you want to have an effective way to train and have budget left over? You’ve built it, but did they come? Research and practical experience shows that small barriers can have a big impact on how many (or few) users will adopt a new technology or technique. The Shepherd’s Guide reduces and eliminates barriers and confusion, and enables users to start leveraging your hard work to solve real business problems. Help desk calls are expensive. What if you could cut your support costs by over 30% simply by deploying a tool to make it easier for your users to understand SharePoint, SharePoint Online, and Office 365? Our customers see these benefits every day. They get greater adoption, better productivity, and fewer support calls. We know that every organization is different. The Shepherd’s Guide is designed to allow you to customize the content to fit your needs. Because the content are publishing pages, you can edit them to include tips, tricks, and policies that are unique to your organization. You can even swap out the screen shots so the screens look like your custom branded site. You can also restrict the guidance that you don’t want to know about – or don’t need – by using SharePoint’s out of the box security controls. Installation is a snap. We provide a client-side installer that you run which pushes the content into your SharePoint server, SharePoint Online, or Office 365. You provide the URL of the site you want the content in, your credentials to log in, and the installer does the rest. Nothing is easier. In just minutes, your users will be able to search for ways to solve their own problems. Do you need a solution that provides short answers but is long on content? With our average video length being less than two minutes, users can get in, get out, and get on with their job. And with over three hours of total video content, we’re long on content that you need. Our content was authored by Robert Bogue, who brings experience in developing instructional content for 25 years, with author credit on 25 books and numerous other content. Robert also worked on the technical and instructional design aspects of over 100 other books – his instructional design experience is unparalleled. We’re the only provider to offer content for SharePoint 2007, SharePoint 2010, SharePoint 2013, and now SharePoint 2016 – so we can help you migrate your users from where you are now to where you want to be. Should I create a list or library app? You must have site collection administrator permissions to install this software.